I hope you are ready for another adventure. If you haven’t done a mystery quilt before, you’re in for a treat. If you participated in our last mystery adventure, you already know how sweet the treat is! Here's how the mystery quilt works. The fabric requirements and cutting instructions are given the first week. Construction steps are posted in the following weeks -- just enough to keep you guessing! On the last week, we will give you the final construction steps and reveal the mystery. Dig through your stash for scraps or yardage in assorted light, medium and dark values as instructed in Fabric Requirements. 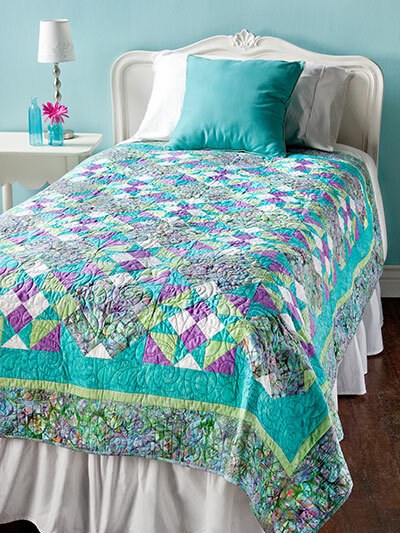 Remember that mystery-quilt patterns emerge best when high-contrast fabric choices in color and/or value are made. Gather the total yardages listed. Now get ready to have some fun! To view or download, you will need Adobe® Reader®. Copyright © 2015 Annie's, 306 East Parr Road, Berne, IN 46711. All rights reserved. This publication may not be reproduced or transmitted in part or in whole without written permission from the publisher.